My inspiration today comes from one of my very first pins from a blog that no longer seems to exist - good thing I pinned it when I did! 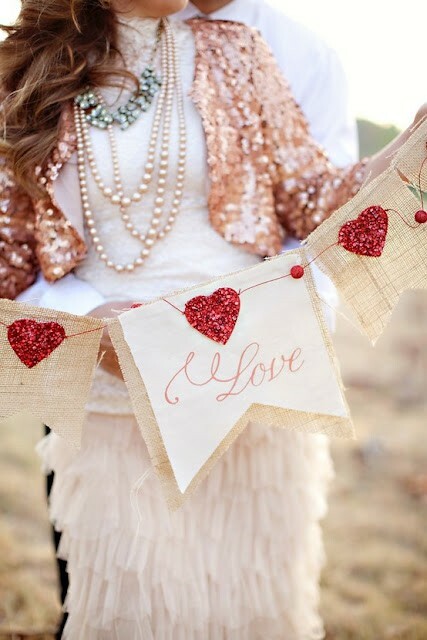 I just love all of the sparkle in this picture and the simplicity of the burlap and glitter hearts. Love. I'm taking the remnants from a project that I started over the holidays and never finish. 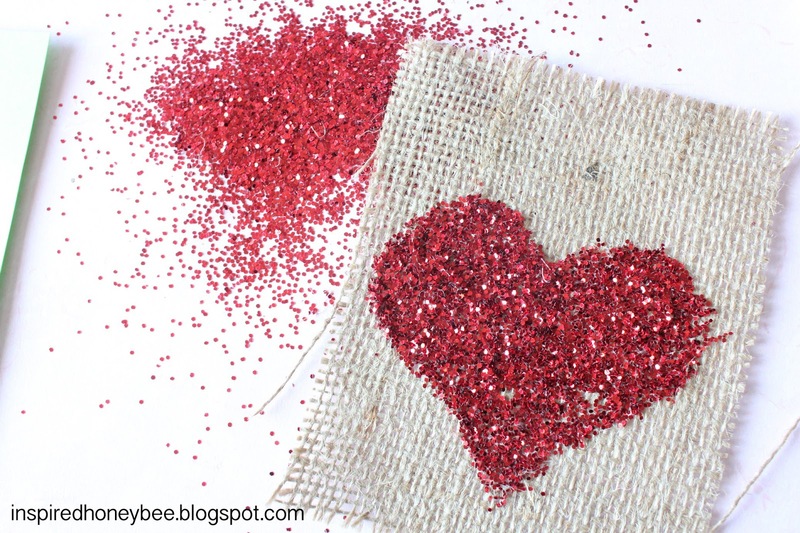 The burlap squares were cut and I had glitter, glue and a brush on hand. The heart template I cut with the Cricut. 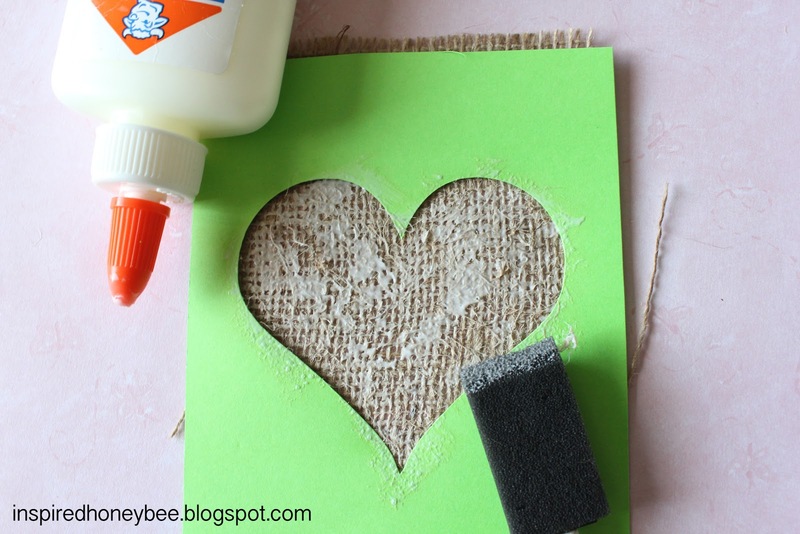 Using the template, I dabbed on the glue to the burlap and then added the glitter ... and then a lot of patting to remove the extra glitter. It was a cold day so the glitter project had to be indoors. Never a pretty clean-up. With a sewing machine, I attached jute along the top of the four squares. 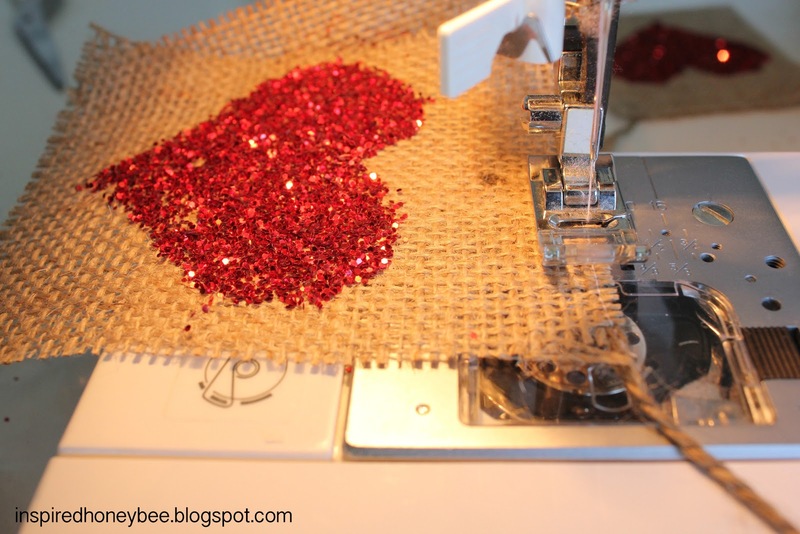 To avoid the sewing machine, this is a simple project that can easily take a few stitches with needle and thread instead to secure the squares. 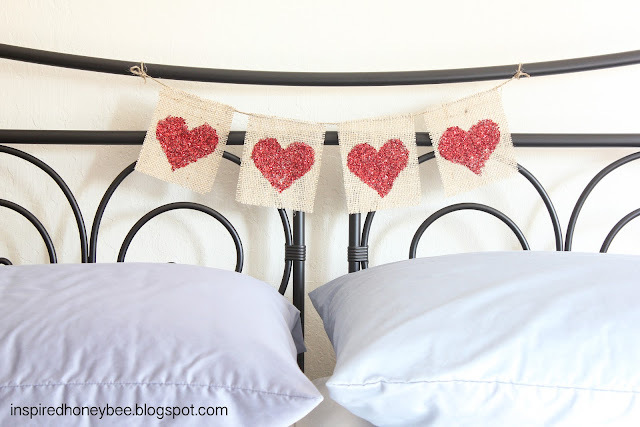 How cute is the final product as a sweet headboard decoration? 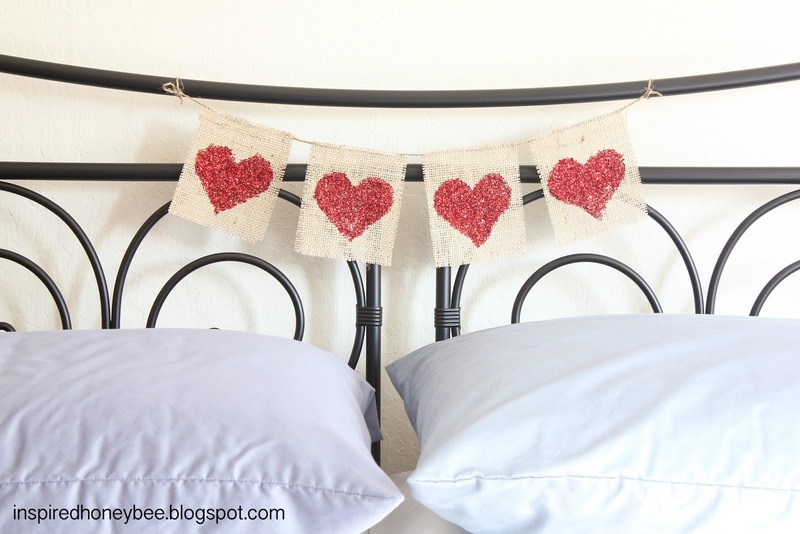 Celebrate Valentine's Day by putting it over the kiddo's bed for sweet dreams, or add a little sparkle in your bedroom! So pretty! 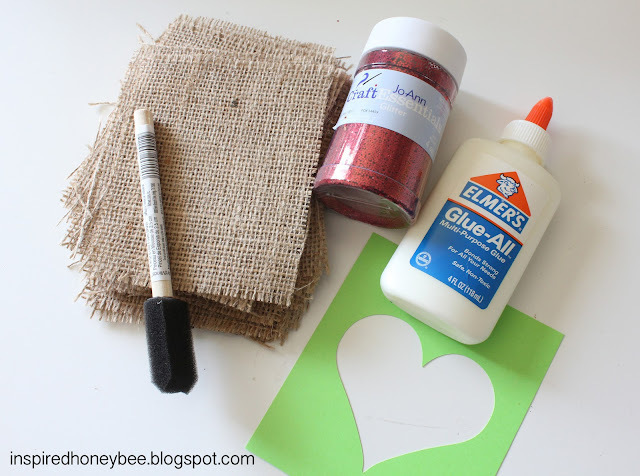 Never thought of glitter on burlap. Just pinned! That's adorable! So simple and sweet ;) I'm a new follower to your blog. Have a great week! That's gorgeous!! I want to make one right now, haha. Seriously, I'm loving it. Glitter is the best. So pretty! And I love it on the headboard! Pinned! That is darling!!! I love the glitter you used. Such a great idea! Thanks so much for sharing at Thursday's Temptation. 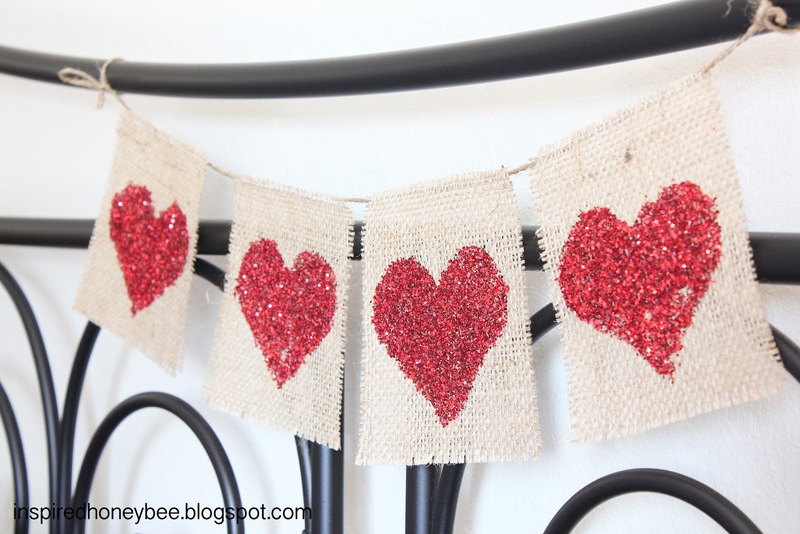 I am going to be featuring your cute banner at tonights link party! This is so great! I simply love glitter and I've never thought to decorate my headboard before...genius! I'm hosting a loving valentine's day party and I'd love for you to join in. YEA! 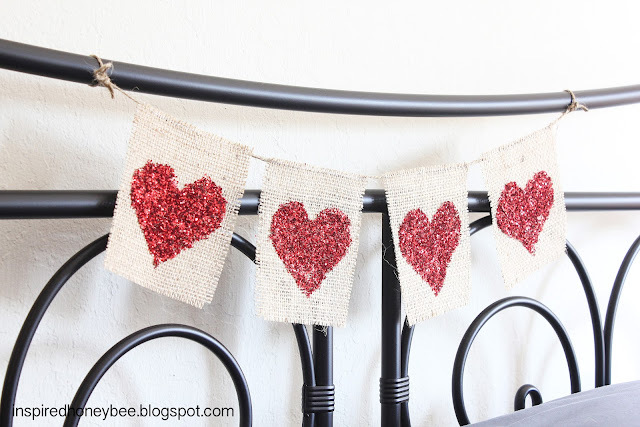 Thanks for sharing at the Loving Valentine's Day Party! I'm so glad you did!